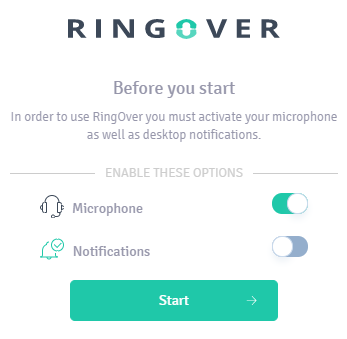 When you log in to myringover.com for the first time, you’ll be asked to activate your microphone in order to be able to make and receive calls. You can start making and receiving call from the RingOver web app! Just click the switch to activate your microphone: to activate your microphone. Firefox will ask you to confirm your choice by opening a window to the top left of your browser. It will turn green when activated: .